Theorising the relation between state and capital is an important task. This review article looks at two important contributions to the understanding of this problem and places them in the context of the failed strategies of the left. School, the police, social workers, the DSS, prisons....the proletarian rebel knows full well that the state is her enemy! This immediate experience of the repressive nature of the state is a vital touchstone against those that would urge us to elicit state power to our advantage. 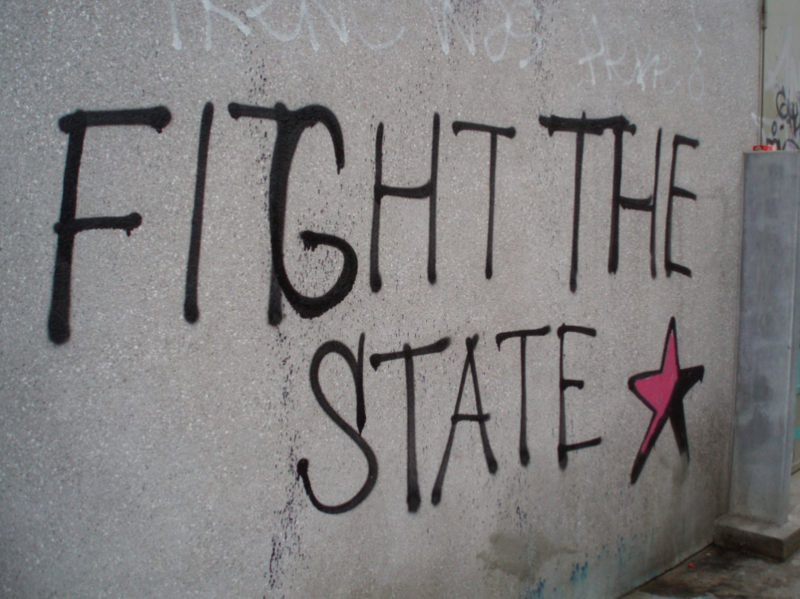 Yet a simple gut reaction to the state is not enough; it is necessary that we understand both what the state is and how its role and function in the class war is changing. This has become vitally important in recent years. With the rise of the New Right under the libertarian banner of minimising the state, we are confronted with the wholesale privatisation of state provisions. In the face of the war of all against all of the market, state provision of welfare and the NHS etc. all too often seems the preferable false choice. Without a clear understanding of what the state is, and how its role and function is changing, it is all too easy to be led into either defending in isolation a simplistic anti-state position - a position that all too frequently ends up as seeing the state as simply an instrument of some grand conspiracy of capital - or else abandoning an anti-state perspective in practice and relapsing into liberal campaigns that seek simply to lobby the state for various reforms. It is therefore vitally important that we develop our theory and understanding of the state. But where should we begin? Together The State Debate and Post-Fordism and Social Form provide perhaps the most sophisticated Marxist theory concerning the state that has been developed in the last two decades, and both are worth consulting in order to come to an understanding of what the state is and how its role and functions are changing in the present period of capitalism. "The papers by Colin Barker, Joachim Hirsch and Bob Jessop provide a flavour of other sides of this debate. However, I make no apologies for the balance of the collection, or for the partisanship of this introduction". "There are two crucial issues in the discussion of Fordism and the Fordist state. The first is the nature of the present crisis. Is capitalism already on the way to overcoming the international crisis and to establishing a relatively stable basis for a new period of prosperity, as the post-Fordism thesis suggests, or are we still in the middle of a prolonged and quite unresolved crisis of overaccumulation, as Clarke suggests? The answer to this question affects dramatically how one sees the propects of world development and the urgency of the socialist destruction of capitalism. It is important to remember that the last major crisis of capitalism was resolved only through the destruction of millions of workers... . The second issue is how one understands the driving force of capitalist development. Given that there are major changes taking place in the pattern of capitalist social relations at the moment, how is one to unerstand these changes? As the replacement of one model by another, driven forward by the objective tendencies of capitalist development, or as a process taking place through constant, hard-fought struggle? If the former, we are confronted by a new reality, a closed structural-functionalist world which we are powerless to change, and all we can do is adapt or cry out in despair. But if the latter, we are faced with no 'reality' other than the reality of a constant struggle, a struggle of which we are inevitably part." For Clarke, the selection of papers he presents in The State Debate represent a re-emergence of a debate that originally began in the early 1970s and culminated in State and Capital : A Marxist Debate in 1978. Indeed, The State Debatecould be seen as sequel to this earlier work. As a consequence, Clarke in his introduction sets out by tracing the development of this debate of the 1970s and placing it within its wider political and historical context. For Clarke, the debate in the 1970s arose from the inadequacies of the traditional Marxist theories of the state that been inherited from the two wings of classical Marxism. On the one hand the Leninist theories of state monopoly capitalism saw the state as simply an instrument of monopoly capitalism which had to be smashed before a socialist state could be constructed through which the 'dictatorship of the proletariat' could then be imposed. On the hand reformist and revisionists theories took the state as being simply a neutral instrument that could be wielded to the advantage of which ever class was able to assume the reins of government. For Clarke, both the Leninist and reformist approaches to the state ran into problems with the electoral advance of social democratic parties in the 1960s. The theory of state monopoly capitalism was unable to account for how it was possible for social democratic parties to take charge of the state apparatus and hence it was unable to provide an adequate theoretical basis to inform the politics of those socialists within such parties. At the same time the reformist approach was unable to define the limits of state power. It was therefore unable to explain the difficulties facing socialist in exercising state power to the advantage of the working class. So, for socialists attempting to advance socialist policies within the state apparatus both the theory of state monopoly capitalism, which denied the possibility of democratic socialism, and reformist theories, which denied the obstacles and limits to democratic socialism, traditional Marxist theories had ceased to be adequate. But there was a further inadequacy which, as we shall see, for Clarke was to prove even more important. Both these strands of traditional Marxist theory centred on the question of seizing state power. For the largely libertarian orientation of much of the New Left of the 1960s and 1970s such an orientation towards state power was irrelevant. It was in response to this situation that the first attempts were made to develop a Marxist theory of the state, which gave rise to the great debate between Milliband and Poulantzas. Miliband began by raising the all important question of why it was that the state, even if it had a democratic constitution and the majority of the population were working class, acted in the interest of the capitalist class? Why was it that even democratic states were capitalist states? Drawing from the empirical and commonsensical traditions of British academia Miliband's answer to this was simple enough. The state acted in the interest of the capitalist class: firstly because the leading positions within the state apparatus were held by members of the bourgeoisie; and secondly because the economic power behind capitalist lobbyists was far greater than other interest groups. Thus although the state may be democratic, and while it may be open and pluralistic, the economic power of capitalists interests and the bourgeois sympathies and perceptions of those running the state apparatus meant that the policies of the state were dominated by the minority interests of the bourgeoisie. "...was unable to conceptualise the limits to the exercise of state power on behalf of capital, except to the extent that such exercise met with popular resistance. This laid Miliband's account open to the charge of offering an 'instrumentalist' theory of the state, which ultimately reduced the state to an intrument of the capitalist class, and a 'voluntarist' theory, which saw the limits to state power in the organisation, will and determination of the contending classes." In Britain, where even the leadership of the Labour Party was dominated by public school and Oxbridge graduates, and the state was infused by notions of class privilege, the ideas of Miliband may have appeared not only sufficient but even self-evident. However, they soon became contested by the far more sophisticated theories emanating from France which were being put forward most forcefully by Poulantzas. For Poulantzas it was simply not enough to say that the state apparatus was dominated by members of the bourgeoisie. In fact there were many instances where the state was run by classes other than the bourgeoisie, or was run by a distinct faction of the bourgeoisie, yet they still were capitalist states that ultimately ensured the dominance of the general interests of capital. Indeed, the problem for Poulantzas was to explain how the state could be capitalist without the bourgeoisie necessarily having to act as the ruling political class. Simply put, the answer Poulantzas offered to this problem was that the state could only act within certain limits that were determined by the capitalist mode of production. The state could only function if it had the power to raise taxes and command material resources; but, so long as the material reproduction of society was based on the capitalist mode of production, this power ultimately depended on the success of capitalist accumulation. If the state persistently acted against the interests of capital then sooner or later the conditions for capital accumulation would be undermined, the economy would be thrown into crisis and the state would find it increasingly difficult to command the material resourses it needs to function. So, for Poulantzas, insofar as society was structured by the capitalist mode of production, the state was always 'determined in the last instance' by the need to sustain capitalist accumulation. Yet within such structural limits Poulantzas suggested there was a large degree of relative autonomy for state policy and political action. Political conflict would necessarily arise between various classes and factions over the determination of state policy and this would give rise to the formation of various class alliances and 'hegemonic blocs' between the dominant classes and factions through which the state was run. As Clarke points out, although both Miliband and Poulantzas went beyond the traditional Marxist theories of the state, they were still bound by the old socialist project of contesting state power. Such a political imperative was increasingly divorced from the practical political struggles that were being fought in the 1970s in which the struggle was primarily against the state rather than for it. As Clarke himself puts it: "This perspective was increasingly remote from the popular struggles which were developing through the 1970s, which confronted the state more and more directly not as the prospective instrument of their liberation, but as the principal barrier to the realisation of their aspirations." This point became increasingly apparent to many within the CSE from their analysis of contemporary struggles around housing and labour processes. It was this that led Holloway, Picciotto, Clarke along with others, to attempt to develop the theory of the state further, so as to consider not only the capitalist content of the state but also its form: that is to not only understand what the capitalist state must do but how it must do it. For a theoretical starting point for such a theoretical project, that would allow them to break from the Poulantzas and Miliband framework, they looked to the state derivation debate that had been developing independently in Germany. For the German theorists any Marxist theory of the state had to begin with the categories of Marx's Capital. For them Capital was not simply a Marxist political economy that was counterposed as a radical alternative to bourgeois political economy, and to which a Marxist sociology, a Marxist political science and so forth could be simply added in accordance with the given disciplines of bourgeois social science. Rather Capital was a critique of political economy as such. It sought to go beyond the analysis of the bourgeois economy to grasp capitalist society as a totality. In doing so Marx's critique had to expose the readily apparent objective categories of bourgeois political economy - money, commodities, capital etc., as reified social relations that assumed the social form of things, and which in turn gave rise to idea of political economy or economics as a distinct 'objective social science'. As a consequence, these German state theorists did not simply set out to develop a Marxist theory of the state within the confines of 'political science', as both Miliband and Poulantzas had sought to do, but rather sought to derive the state form from the very categories of Marx's Capital, and then, in doing so, show how the sphere of politics manifests itself as being both distinct and separate from that of the economy. The implications of this approach was that the state was not presupposed as something separate from capital, which then had in some way to be articulated to it, as either an instrument or as a relative autonomous structure and apparatus, but was rather a manifestation of the essential social relations of capital that necessarily has to present itself as something separate and distinct from capital and the 'economy'. In short, within capitalism, we have to begin by recognising that the state is capital! Of all the German state theorists it was J. Hirsch who was most influential in Britain, and it was his version of state derivation that served as the inspirational source for the attack on the Miliband-Poulantzas orthodoxy, that was collected together by Holloway and Picciotto in the seminal : The State and Capital: A Marxist Debate. However, even then, as Clarke admits, there were vital differences between Hirsch and his British adherents, the full significance of which only began to emerge with Hirsch's attempts to reformulate his theory of the state in the light of the new French regulation school in the early 1980s. It is these differences that underpin the arguments and polemics fought out in the articles collected together in both The State Debate and Post-Fordism and Social Form. As Holloway and Bonefeld make clear in their introduction to Post-Fordism and Social Form, Hirsch had been preferred over other German state theorists of the 70s because he went furthermost in escaping from the 'capital logic' approach, that was prevalent within much of the German debate, which tended to see the state form as simply a function arising from the needs of capital for an apparently independent social form above competitive battle of contending capitals. Indeed Hirsch had insisted that the form of the state had to be logically derived before any functions could be ascribed to it. As a consequence the state form could be seen as subject to class struggle. In so far as there were differences between Hirsch and his British followers it was over the importance of historical analysis. Indeed, in their introduction to The State and Capital, Holloway and Piccitto had criticised Hirsch for taking the emergence of the state form, and with it the manifest separation of the economic from the political, as a 'once and for all' historical act, rather than one that had to be repeatedly reimposed through class struggle. However, at the time this difference was seen mainly as a matter of emphasis which only implied the need to supplement Hirsch's state theory with more historical orientated analysis. With Hirsch's reformulation of his theory of the state in the 1980s it became clear that this difference of emphasis between logic and history was symptomatic of more fundamental differences that arose from Hirsch's failure to fully break with the functionalism of the 'capital logic' approach. In his articles reprinted in both The State Debate and Post-Fordism and Social Form , Hirsch attempts to give his theory an historical dimension by adopting the French regulation approach that saw the crisis in capitalism of 1970s as a shift from a Fordist 'mode of accumulation', involving mass production and mass consumption, to a post-Fordist mode of accumulation of flexible specialisation etc. For the French regulation school, this shift in 'mode of accumulation' which centred on the process of production, demanded a wider shift in the regulative institutions of society that ensured the overall reproduction of capital and labour. This, for Hirsch, implied a change in state form from a Fordist to a post-Fordist state, which he then sought to analyse. In embracing the French regulation school so as to historicise his theory of the state, Hirsch relapsed into structuralism. Indeed, as Holloway and Bonefeld point out, Hirsch takes up many of the structuralist concepts of Poulantzas. As a result, Hirsch falls into the ultimately determinist and fashionable view of the 1980s which saw the emergence of a post-Fordist/post-modernist era as the inevitable outcome of the development of the objective laws of capitalism, with all the political implications of accepting the 'new realities' of the end of the working class and the rise of designer socialism that this implied. In The State Debate and Post-Fordism and Social Form these political implications are drawn out and ruthlessly criticised at a theoretical level. As such we find several lines of attack. Firstly there are those at the level of method through which the regulation school and Hirsch's reformulation of state theory is attacked on the basis of its disarticulation of class struggle and structure, its underlying technological determinism, and its misreadings of Marx. While secondly there are those on a historical level which raise questions over the precise periodisation of capitalism into pre-Fordist, Fordist and post-Fordist modes of accumulation. Through all these lines of attack, as we have already noted, the underlying argument against the structuralist orthodoxy is that capital is class struggle. "...we must come to a clear understanding of the trends in social development and of changes within capitalist formations. Only then can we realise the relevance of movements and conflicts and the conditions for social-revolutionary politics in today's society, and only then will we be ready for political action." Or Jessop who, in failing to fully recognise the political implications of the regulationist theory and the reformulation of the state approach, blithely suggest they provide a 'good framework for a research programme'; our sympathies are clearly with Clarke, Holloway, Bonefeld et al. Yet if we consider the polemic more closely we can only take sides with certain reservations. Firstly, on closer inspection, it becomes clear that Clarke, Holloway, Bonefeld et al in making their polemic against the post-Fordists, fail to critically situate themselves and their relation to the left. Indeed, the sheer vehemence of Holloway and Bonefeld's attack on the post-Fordism is perhaps in some sense due to their belief that post-Fordism, and with it designer socialism, is nothing other than a betrayal. Yet the degree to which these theoretical comrades were originally on the side of 'real socialism' in the first place is never adequately considered. Secondly, the insistence that capital is class struggle, while vital in the polemic against structuralism is not without its own problems and ambiguities. Let us first consider our reservations concerning Clarke, Holloway, Bonefeld et al with regard to their situation and relation to the left. For this we should perhaps look a little closer at Clarke's introduction to The State Debate. While this introduction seems a reasonably comprehensive contextualisation of the debate and its origins there are two points that are not adequately addressed and which gives us clues to the politcal position of Clarke, Holloway, Bonefeld et al's. Firstly Clarke does not really explain why the debate over the state became silenced in the late 1970s. He states that the debate was primarily for 'political clarification' and alludes to the changing political climate but does not tell us anything further. Secondly, he does not discuss in any detail the political context that led to the re-emergence of the debate in the 1980s nor its political significance. In order to draw out the implications of these omissions we must seek to place Clarke's history of debate into the wider and more explicit context of the crisis of the New Left of the late 1970s and the failure of the left strategies of the 1980s. In the wake of the proletarian offensive of the late 1960s and early 70s the New Left broke into two parts. On the one side there were, what have since become known as, the new social movements; feminism, ecology, squatting, gay liberation, black liberation etc. All these movements, whether 'oppositional' or 'alternative', combined a utopian vision for the transformation of society, preserving the communist hopes of the heights of the proletarian offensive, with practical everyday activity on the personal level. As a consequence these movements adopted a distinctly anti-state ideology and as such came to constitute what became known at the time as the libertarian left. On the other side, in the face of the 'political and social realities of the post '68 era' many in the New Left turned towards reviving the organisations of the traditional left. Thus not only was there a resurgence of Trotskyism (at least in Britain) either in revised or in traditional forms, but also a concerted attempt to renovate the old Stalinist Communist Parties! So rather ironically, while the New Left had originally emerged as a reaction against the excesses of Stalin that had resulted in the invasion of Hungary in 1950s, less than twenty years later many New Leftists re-entered the Communist Parties so as to reform and rehabilitate them. This resulted in the emergence of Eurocommunism which sought to distance the Communist Parties of Western Europe from the ideological commitment to 'proletarian revolution', a commitment that had in effect served to reduce the Western Communist Parties to being little more than a tool of USSR foreign policy during the Cold War, in favour of a electoral strategy of capturing state power. For the erstwhile students of the class of '68, who had now begun their 'long march through the institutions', Leninism, whether of the Stalinist or Trotskyist variety, offered a privileged role as leading intellectuals planning the political strategy on behalf of the working class. As these students of '68 became the lecturers of the 70s, Marxism became academically respectable. But this academic Marxism was dominated by the structural Marxism of Althusser: the arch renovator of the French Communist Party, who saw the party intellectuals as the sole producers of scientific truth. As Althusserain Marxism swept all before it, being championed by the vanguard of intellectual Marxists of the New Left Review , so Poulantzas, structural Marxism's representative in the field of political science, rose to pre-eminence. This then is the broader context within which the Poulantzas-Miliband debate emerged. But by the late 1970s both the two separate wings of the New Left were in crisis. In Britain the proletarian offensive had been successfully contained into established political and economic channels and had as a consequence become diffused. Capital's counter-offensive had now begun. This had become clear when the Labour Party formally abandoned Keynesianism and embraced monetarism with James Callaan's speech to the Labour Party conference in 1976, and his subsequent letter of intent to the IMF. This was followed by a programme of drastic cuts in public expenditure and the complete abandonment of the Labour manifesto's commitments to make an 'irreversible shift of wealth in favour of working people'. With the rise of the New Right and the first cold breezes of monetarism, the New Left was thrown into crisis. For the libertarian left the new political and economic climate threatened to reduce the space for building and experimenting with alternative structures and lifestyles, while the increasing power of the right exposed the weakness and lack of unity of the new social movements that were all busy 'doing their own thing'. At the same time, both the weakening of working class militancy and the open failure of the Labour Government, and its traditional social democratic project, had opened the way for the growing popularity of a more virulent right. The looming prospect of a Thatcher Government, along with the rise of the National Front, cast doubt amongst those on the 'far left' that only a few years earlier had been 'preparing for power' after the fall of the Heath Government. The impact of this crisis was to stimulate an intense bout of self-criticism that was finally resolved in an all-embracing call for left unity. Perhaps one of the most important examples of this reaction, and one which Clarke, Holloway, Bonefeld et al politically connect to, was Beyond the Fragments. Beyond the Fragments was originally a discussion paper that brought together the various experiences of three women who had been active in both the feminist movement and various Trotskyist and 'far left' groups. As such it ably expressed the crisis confronting both the feminist movement and the more 'soft' Trotskyist groups such as the IMG that had sought to mobilise the new social movements within a Leninist framework. By the late 1970s the feminist movement was in deep crisis. With the original impetus of 'consciousness raising' running out of steam, and in the changing political and economic climate, the womens' movement became racked with tensions and divisions that had been emerging between socialist and radical feminist. In the face of the general retreat of radical feminists into either mysticism or separatism, socialist feminists had become increasingly concerned that the feminist movement was becoming little more than a middle class ghetto that was failing to address the everyday concerns of working class women. A failing that was becoming ever more important with the threat to womens' rights posed by the rise of the right. Yet, at the same time, socialist feminism had found the often authoritarian and depersonalised forms of organisation and politics of the 'traditional male left' in stark and uncomfortable contrast to forms of organisation and politics that had been developed within the feminist movement. What is more, their repeated efforts to reform such organisations and to reorientate their politics in a feminist direction had proved more than disappointing. It was in this context that Beyond the Fragments emerged as an attempt to go beyond the failure of both the feminist movement and the Leninist left. Drawing on their experiences, the contributors to this work provided perceptive criticisms of both these movements, and implicitly the New Left in general. Yet for all its perceptiveness in detail, Beyond the Fragments failed to go far enough. It failed to see how the left could act as a means to recuperate struggles, and for all its criticisms of Democratic Centralism it failed to get beyond the idea of Party and social democratic politics. In refusing to impose a solution to the crisis of the New Left, in recoiling from the 'ultra leftism' of the autonomist movements that at the time were raging in Italy, Beyond the Fragments ended up as a vague appeal for an uncritical left unity. An appeal for unity that eventually ended up as a rallying cry to join the Labour Party! "These 'radical' specialists (radical lawyers, radical architects, radical philosophers, radical psychologists, radical social workers - everything but radical people) attempt to use their expertise to de-mystify expertise. The contradiction was best spelled out by a Case Con [an organisation of 'radical' social workers] 'revolutionary' social worker, who cynically declared at a public meeting, 'the difference between us and a straight social worker is that we know we're oppressing our clients'. Case Con is the spirit of a spiritless situation, the sigh of the oppressed oppressor; its the 'socialist' conscience of the guilt ridden social worker, ensuring that vaguely conscious social workers remain in their job, whilst feeling they are rejecting their role...The academic counter-specialists attempt to attack (purely bourgeois) ideology at the point of production: the university. Unwilling to attack the instituition, the academic milieu, the very concept of education as a separate activity from which ideas of separate power arise, they remain trapped in the fragmented categories they attempt to criticise. Non-sectarianism is the excuse for their incoherence..."
"When the crunch comes, when Whitehall's commissioners move in to deal with over-spending, will people in these areas unite to protect the councils that defend 'their' services? We hope so, but we fear not". Yet for all this, In and Against the State, with its resolute 'non-sectarianism', ended up simply appealing for the left to take these concerns on board. It failed to see how the social democratic project of 'building socialism' was a necessary part of the state-form and its demobilising of the working class. As a result it too ended up in the movement for an critical left unity which subsequently underlay the mass stampede into the Labour Party. It was this left unity, that preceded the influx of much of the New Left into the Labour Party at the end of the 1970s, which brought an end to the original debate over the state. Within the broad church of the Labour Party all the former divisions were dissolved in the common project of 'democratising' and capturing the Labour Party for the left and seizing control of local government as a stepping stone towards winning the next election. This not only culminated in the near victory of Tony Benn in the deputy leader elections in 1982, and the changes in the Labour Party constitution, but also, and more importantly, with the fall of the GLC into hands of the left. The capture of the GLC allowed the co-existence of various tendencies within a broad 'right on' left populism. Erstwhile eurocommunists could practice implementing an alternative economic strategies for an economy which was, after all, 'bigger than that of many Third World countries'. The neo-Gramscian proponents of establishing a cultural hegemony of the left could revel in the numerous festivals put on by the GLC, while the various new social movements found official recognition in the appointment of various committees and officials. Yet you did not have to be a reader of Class War to know that the GLC was one big gravy train for trendy middle class professionals. The appointment of numerous highly paid professionals to look after special interest groups such as blacks, gays women etc. did little to 'empower' the class. Indeed, they often worked against the class by dividing people into special interest groups. In Lambeth the lefty council did not hesitate to evict squatters so that it could build a housing advice centre so that social workers could have a place to advise the homeless! The politics of the GLC was often more to do with image than anything else. A point borne out not only by the insistence of renaming everything in 'right on terms', so that for instance professionals became known 'workers' (thus lawyers became 'legal workers' while accountants became 'finance workers' and so forth) but also in its gesture politics. Ken Livingstone's incessant need to maintain his reputation culminated in the London Transport fiasco when, after the law courts over-ruled the GLC's cheap fares policy, Red Ken threatened to defy the law only to back down at the last minute, in the end managing to pose for the cameras buying his ticket showing he wasn't such a 'red' after all!. Clarke significantly avoids dealing with the left in the 1980s. While he declares his aversion to the dangers of a left populism, he is far from being unsympathetic to the politics of 'harnessing the resources of the local state' and concludes that while such strategies failed they should not be considered misguided. For as he says 'history judges the losers harshly'. This failure to criticise the politics of the GLC means that Clarke's introduction fails to draw out the full significance of the State Debate as part of a response to the immediate aftermath the defeat of this left strategy of the early 1980s. For the rats fleeing the sinking ship of the left, the leap from the image politics of the GLC to the designer socialism of Marxism Today and its associated fads of post-modernism, post-Fordism post everything, was after all not that great. Indeed, it was the 'socialist planners' of the GLC that hailed post-Fordism as the way forward to regenerate London's economy, drawing as their model the Communist Party controlled municipalities of the 'Third Italy'. It is only by understanding the debate over the state and post-Fordism etc. as part of a wider polemic against what is perhaps seen as a betrayal, or at least a pessimistic turn, of erstwhile 'comrades' that we can appreciate much of the underlying verhmence that we find in many of the articles in both these volumes. And it is perhaps only through such an understanding that we appreciate the full political significance of this 'debate'. This brings us to the second part of our reservations towards Clarke, Holloway, Bonefeld et at. The political ambiguities that we have outlined above are reflected in at the abstract theoretical level. While a comprehensive analysis of this beyond the scope of this review we should perhaps note a few salient points. In Post-Fordism and Social Form we find Holloway and Bonefelds' repeated insistence against Jessop that capital is class struggle! Indeed this insistence is perhaps vital for them if they are to press home their polemic against what they see as the structuralist orthodoxy of much of Marxist theory. Yet while we must be sympathetic to this stress on class struggle we should perhaps retain certain reservations. Thus when they claim the backing of Marx by returning to Capital to derive the centrality of class struggle to Marx's own analysis then we must concur with Jessop when he indicates that the categories of Capital are very far from being explicitly embued with class struggle. Indeed, we would argue that in Capital Marx necessarily takes as his starting point the critical perspective of the bourgeoisie. A perspective through which class struggle is only implicit, or at the most marginal to the development of the exposition. As a result what strikes the reader who is aquainted with the importance of the question of class struggle for Marx is its apparent absence in the pages of Capital. To understand what capitalism is, Marx was obliged to begin his critique from this critical perspective of the bourgeoisie. But from this perspective capitalism does appear as simply the autonomous movement of structures; capital developing in accordance with its own objective an inexorable laws. To make class struggle explicit we have to go beyond these categories. We have to invert them. The failure to do so can only generate problems particularly when we seek to return to Marx to derive our theory as form-analysis seeks to do. Thus for example when Marx shows how labour takes the social form of value he presupposes the defeat and subsumption of the worker. Indeed, as self-expanding value, capital is the presupposition of the repeated subsumption of living labour; it is the triumph of dead alienated labour over the living. Capital is class struggle only in that it is not class struggle; that is in so far as it is the provisional defeat of the working class. A similar argument could be advanced for the state formas a defeat of the autonomous organisation of the working class. It would be unfair to say that Holloway and Bonefeld etc. are completely unaware of this. Yet we may suggest that their failure to fully recognise this point leads them into certain ambiguities in order to preserve the value of their role within the state. Thus, for example, Holloway makes a distinction between state-form and the state apparatus which, as Clarke has pointed out, seems to imply that: "...the bourgeois state apparatus can somehow be given a socialist form." So what then are to make of The State Debate and Post-Fordism and Social Form? Both Post-Fordism and Social Formand The State Debate provide a important analysis of the nature of the state and the current period of capitalism. An analysis that is for the most part directed against the prevalent structuralist and objectivist Marxist orthodoxy. As such we are sympathetic to them but with certain reservations. For us the struggle is not to 'build socialism' or to democratise capitalism, it is for communism. A project that demands no complicity with the recuperative strategies of the left and social democracy.